Palestinian Authority Chairman Mahmoud Abbas told the United States that he will continue to pay terrorists' families for terror attacks against Jews. "I do not intend to cease paying salaries to the families of prisoners and martyrs, even if it means I lose my position," Abbas told Kan 11. "I will continue paying their salaries until my dying day." US Special Middle East Envoy Jason Greenblatt and US President Donald Trump's son-in-law and White House adviser Jared Kushner on Thursday met Israeli Prime Minister Binyamin Netanyahu in Jerusalem. 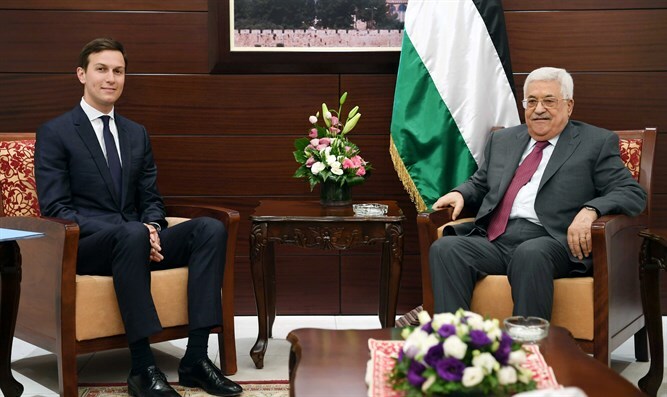 Later, they met Abbas in his Ramallah headquarters. Trump uploaded a short video of Netanyahu's meeting with Kushner to his Instagram account. "Thank you Prime Minister @b.netanyahu and Jared! Lets advance #Peace, #Prosperity, and #Security in the area. There is no doubt that our relationship with you is stronger than ever! See you soon. #USA #Israel," Trump wrote. The PA's official news agency said Abbas told the US team that "we know things are difficult and complicated, but with effort and goodwill nothing is impossible. We very much appreciate President Trump's efforts, and the fact that he said he would work to make an historical peace agreement." "President Trump is very optimistic," Kushner told Abbas. "He hopes for a better future for the Israeli and Palestinian nations, and we hope they will manage to work together and live together for many years, and will merit a better life." Thank you Prime Minister @b.netanyahu and Jared! Lets advance #Peace, #Prosperity, and #Security in the area. There is no doubt that our relationship with you is stronger than ever! See you soon. #USA ???????? #Israel ??????? ?